Moreton Pinkney, like its near neighbour in south Northamptonshire, Silverstone, had a reputation in the early nineteenth century as ‘a very rough place’. Or so it appeared, in 1832, to its new curate, Thomas Mozley, who claimed ‘there existed no adequate means for the maintenance of order, health, or decency’. 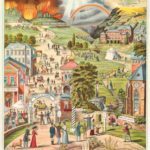 Mozley was one of the most ardent proselytizers for the ‘Oxford’ or ‘Tractarian Movement’ in the late 1830s and ‘40s, a High Church form of Anglicanism whose influence we have encountered before. 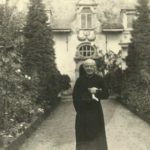 He had been a pupil of Henry Newman, the future cardinal, at Oriel College (which held the living of Moreton Pinkney), and would marry Newman’s sister in 1836. 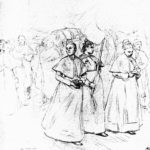 Clergymen no doubt have relatively high standards of behaviour, but Mozley’s strictures concerning Moreton Pinkney also found echoes in the contemporary press: according to the Banbury Advertiser for 3 September 1857 it had an ‘unenviable notoriety’ for lawlessness. The school was but half filled. It had a rival too strong for it. This village of misery and dirt, of cold and nakedness, of pigs and paupers, was the busy seat of a beautiful and delicate manufacture. As many as a hundred and fifty women and girls made pillow lace. On the higher green was the ‘lacemaking school,’ as it was called. Near thirty children were packed in a small room, and kept at their pillows from six in the morning, all the year round, to six in the evening. They were arranged in groups of four or five, round candles, about which were water-bottles so fixed as to concentrate the light on the work of each child. Girls were sent thither from the age of five, on a small weekly payment. It kept them out of the way in the day, and it prevented the wear and tear of clothes. The food side of the calculation was doubtful, for the parents always said the lacemakers ate more than other children, though it did not do them much good. For a year or two the children earned nothing. They could then make a yard of edging in a week, and, deducting expenses, they got twopence for it. By the time they were eleven or twelve they could earn a shilling or eighteenpence a week. There were women in the village who could not clothe their own children, or present themselves at church, who had made and could still make lace to sell in the shops at 20s. or 30s. a yard. The more costly lace was generally ‘blonde,’ that is, made with ‘gimp’ or silk thread. The makers were all bound to the dealers by hard terms, so they said, and obliged to buy at the dealers’ terms their gimp and thread. They took great pride in the number and prettiness of their bobbins, making and receiving presents of them, and thinking of the givers as they twirled the bobbins. We took a good deal of the lace, and disposed of it amongst our friends. My youngest sister set up a pillow, and made some yards of good lace. I learnt to be a critic in lace, and an appraiser. Though all these children were taught to read, and even to write and to sum a little, they were of course very backward, and they soon ceased to do anything but make lace. 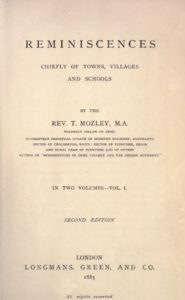 Mozley thought of backwardness in terms of Bible knowledge, and his response was to run evening classes for boys and girls which were, apparently, much appreciated. 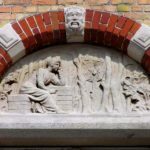 Thirty years later he met one member of his New Testament class who came as a lace-dealer to his new vicarage in Finchampstead, Berkshire, and who was able to pass on all the parish gossip. Some of that gossip probably concerned the extensive Talbot family of Hog Lane, ‘believed to be of Gypsy extraction’. As many Talbot womenfolk were lacemakers, we quote this section in extenso, not least because of its discussion of the ‘truck system’. Although illegal, it was common practice not only among bootmakers but also among lace-dealers, who were often also grocers. They obliged lacemakers to take payment in kind rather than coin, which forced the workers to hawk the overpriced goods for themselves. As we have seen, Reverend Ferguson of Bicester discussed the same abuse. The Talbot clan contained some remarkable specimens. George was a gigantic fellow a well-sinker and excavator. He did not make much appearance at Moreton Pinckney; indeed, it was said that he had married one or more wives besides the one on duty there. She might be supposed a match for him, for in a terrible quarrel she had run a knife right through his arm. He was in prison part of my time for deserting his family. His mother took it much to heart, and when I was expecting some sentimental explanation of her sorrow, told me she knew what the prison allowance of bread was, and that George would starve on it. For some years we sent her an annual present, but had to stop it for a very sad reason, of which I never heard the full particulars. One or two of her sons were in the employment of shoemakers at Northampton, or one of the other seats of that trade. They brought home boots and shoes, which poor Phillis took, and used or sold. She had to suffer a term of imprisonment as a receiver of stolen goods. The practice was the subject of long discussions in Parliament for many years, and had more advocates than might be now supposed. One of the chief objections was the opportunity it gave the workpeople for robbing their employers. They carried about goods which they said had been given them in lieu of money wages; and, as the practice was universal, they were not suspected, nor could a suspicion have been followed up. In the matter of lace it continually occurred that when the makers had every reason to believe the dealers would take their work on existing terms, they found they had themselves to find purchasers on whatever terms they could. In those days law was invoked much more freely for the protection of trade than it is now, when manufacturers and dealers are told to take care of themselves. The case against Phillis Talbot was rather more serious than this summary suggests. In the hard and hungry winter of 1848, according to the Oxford Chronicle Northamptonshire was rife with rumours and alarms about burglaries and highway robberies. Well-off farmers feared a return to the days of the infamous ‘Culworth Gang’, who terrorized south Northamptonshire at the end of the eighteenth century and whose memory was very much alive in places like Moreton Pinkney (and whose exploits may feature in a future blog piece). On 15 December, a group of armed men, their faces blackened, broke into the farm of Thomas Lovell in Catshanger. Firearms were discharged and linen, silver, clothing and foodstuffs were stolen. An investigation led to the arrest of Phillis’s son, Benjamin, whose age was given as 11, as well as several members of the Prestidge family who were related to Phillis by marriage and whose name ‘had become so familiar in the records of county crime’. During searches of houses in Moreton Pinkney Phillis was seen hiding some boots that were part of the thieves’ hoard: she was charged with receiving stolen goods. At Northampton Lent Assizes in 1849, she was condemned to one month in prison, a comparatively lenient sentence justified ‘on the ground that she was a mother endeavouring to shelter her child, and that it did not appear that she was of the same lawless disposition as the rest of her family. The prisoner, who seemed worn to utter feebleness with illness and age [she was about 50], and trembled excessively, was accommodated with a chair’. Benjamin, however, was transported for life, along with the other male members of the gang. The Catshanger burglary would have ramifications in the district: at Brackley Petty Session for 9 September 1850 several Moreton Pinkney women, Talbots and Prestidges – ‘a batch of viragoes’ as they were described in the Banbury Guardian – were charged with assaulting other villagers, including Phillis, after a row broke out among women working in the fields about responsibility for arrests. I have no means of supporting my children. There are four of them; three girls and a boy… I have been in Northampton gaol before for not maintaining the children. I wrote to the Poor Law Commissioners in London, and the case was referred to the Brackley Board. I cannot maintain my children. I have regular work three days a week in the minister’s house. 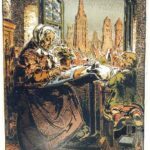 If I had relief equal to other widows with families I would try and maintain my children out of the Union [workhouse]. If I had the same relief as Phillis Talbot I would try… I had sooner die under a furze bush than go into the workhouse. I had rather go to gaol. There is little difference between them. In the gaol you are by yourself, but in the workhouse you have rough company. I had rather have my children with me at home than go to gaol, but I won’t go to the Union. When I was at the workhouse I was separated from my children. I saw them at meals certainly, but we were not allowed to speak to one another, we may as well not see them, if we are not allowed to speak to them. The boys you don’t see more than once a week. In the workhouse very simple things are called bad behaviour, and my daughter was shut up in a dark room. The food is not good at the workhouse, and not good at the gaol; there is very little difference between them. I am not fond of the gaol, but I would leave England rather than go to the Union. 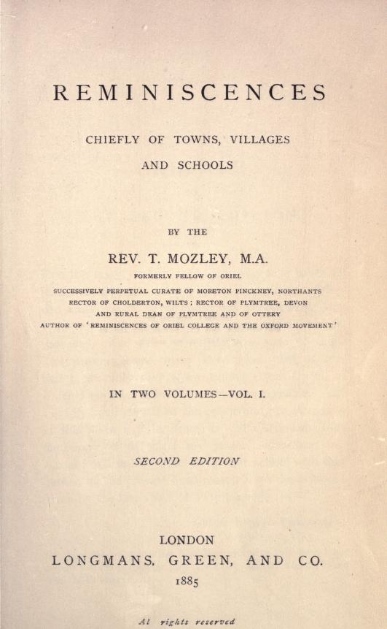 Reverend Thomas Mozley, Reminiscences Chiefly of Towns, Villages and Schools (London: Longmans, Green and Co., 1885), vol. 2, pp. 200, 396. ‘Disorderly Conduct and Rioting at Moreton Pinkney’, Banbury Advertiser 3 September 1857, p. 4. Mozley, Reminiscences, vol. 2, pp. 201-2. Mozley, Reminiscences, vol. 2, pp. 223-4. Mozley, Reminiscences, vol. 2, p. 227. Mozley, Reminiscences, vol. 2, pp. 250-2. Oxfordshire Chronicle and Berks and Bucks Gazette, 23 December 1848. Or so said Colonel Cartwright at the Northampton Quarter Sessions on 5 April 1854: Northampton Mercury 8 April, 1854, p. 3. Northampton Mercury 10 March 1849, p. 4. For more on their various fates see Joan Proud, ‘Round up the Usual Suspects!’, Convict Links 15:3 (July 2001). Banbury Guardian, 12 September, 1850, p. 2. See, for example, the court case arising out of ‘Guy Fawkes Day at Moreton Pinkney’, Banbury Guardian 28 November 1861, p. 3. Banbury Guardian 12 February 1857, p. 3. In Amy Nevell’s collection of bobbins, now in the Pitt Rivers Museum in Oxford, there is one engraved “SARAH PRESTIDGE MURTIN PINGKNEY 1840”. It’s unlikely that this refers to the Sarah Prestidge who was so desperate to stay out of the workhouse in 1857, because she was a Prestidge by marriage, which occurred in 1841. But it’s evidence that the Prestidges, like the Talbots, were engaged in lacemaking.